VideoCardz got its hands on a bunch of new details about AMD's upcoming Radeon R9 295X2. 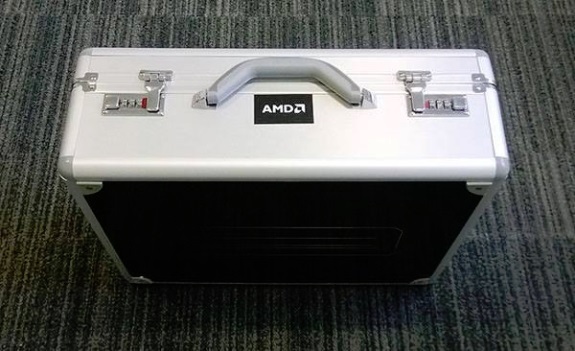 First up, the dual-GPU Hawaii card shipped to reviewers in a steel briefcase that reportedly weighs around 5kg. The samples have shipped out but it's unclear when we can expect the first reviews. VideoCardz heard rumors about an NDA expiry on April 8th but it's unclear whether this is for details of the product itself or the reviews of it. The AMD Radeon R9 295X2 is said to have 8GB GDDR5 memory and includes at least five display outputs: one Dual DVI-D and four Mini-DisplayPorts. The NDA lifts on April 8th, this is when reviewers will be allowed to post first information about the new card. At this point we don’t know whether this embargo lifts on a product itself or more precisely the reviews of it. Well it already happened before, where we had to wait few days for the reviews after rather basic introduction of a product. However the fact that ‘the chosen ones’ are already receiving their samples could suggest that it’s an NDA on reviews. Hopefully.